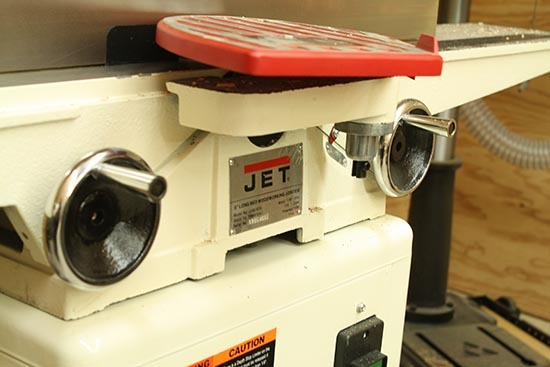 One of the last pieces of equipment to show up for my new woodshop was the JET JJ-6CSDX 6″ Jointer. 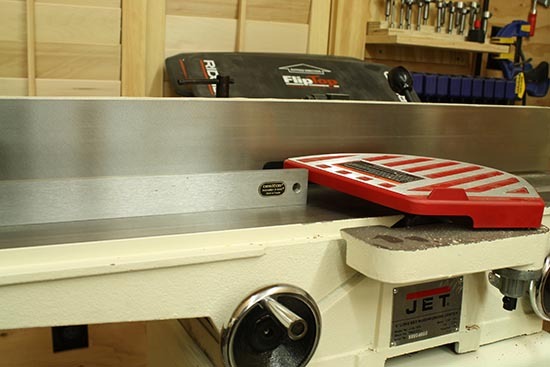 The size of my shop dictated that I get a 6″ jointer so I opted for the JJ-6CSDX with an extra long 56″ table length. Below are the standard specifications and features of the jointer along with my thoughts on it after using it for 6 months in the shop. The JET JJ-6CSDX Jointer is shipped in two packages. The lower cabinet is shipped in one box and the remaining working components of the jointer are shipped in a 2nd box. Assembly took about 1 hour and I found the directions to be straight forward and easy to follow. All of the parts fit well and required almost no adjustment during assemble. The first thing I look at when evaluating new shop equipment is the quality of the materials. The JJ-6CSDX uses heavy duty cast-iron tables and fence. All of the knobs and adjustment wheels are made of metal and feel very strong and durable. The cabinet is made of heavy gauge sheet metal and the entire tool has a nice powder coat finish on it. The only plastic component on it that I did not like was the dust port which I wish was metal. One of the most important factors in determining how well a joint works is how parallel the infeed table is compared to the outfeed table. In order to precisely plane a flat surface the two tables must be co-planer (parallel to each other). To check that the two tables are parallel I used a precision steel straight edge and a set of feeler gauges. I wasn’t able to detect any difference in angle between the two tables which indicates the two tables are extremely parallel. I also spent time checking to make sure that each table surface was flat, and the flatness of the cast-iron fence. All three components were very flat with no detectable deviations when using a straight edge and feeler gauges. Factory set stops for tilting the fence at 45 degrees and 90 degrees were also spot on. The last check was looking to make sure the cutting blades are parallel to the tables as well. Again using a precision straight edge and feeler gauges I wasn’t able to detect any noticeable variations, thus the blades as shipped were parallel to the table. Even though the jointer came to me perfectly set up I’d highly encourage anyone buying one to check the calibration prior to using it the first time. The surfaces on the tables are very smooth and machined nicely. As noted above they are also very flat. Once they were coated with a few coats of wax they provide a very smooth surface that wood glides effortlessly across. Both tables ride on gib slides with appropriate screws for making adjustments. Again the tables came aligned very well so this is something that you might need to adjust down the road if things come out of alignment from use or abuse. Both tables also feature a front mounted hand wheels used to raise and lower the them. This is a great feature and allows the user to easily make adjustments. The infeed side also has a nice scale mounted to it so you can easily tell how much you’re cutting in a pass. Another added feature on the JJ-6CSDX is a 1/2″ rabbeting ledge. This isn’t a feature I will use often but it’s sure nice to have the ability to set it up for rabbets especially if the table saw is set up for something else. The JJ-6CSDX comes with a 1 HP, 1 phase 115/230V TEFC (totally enclosed fan cooled) motor. It’s factory wired for 115 volts, however it can be re-wired to run on 230 volts. I’ve been using the jointer with the factory wired 115V setup. The motor has more than sufficient power for all the materials that I’ve used so far including: Pine, Hard Maple, Walnut, Purple Heart and Poplar. Not once has the motor seemed to bog down or feel undersized. 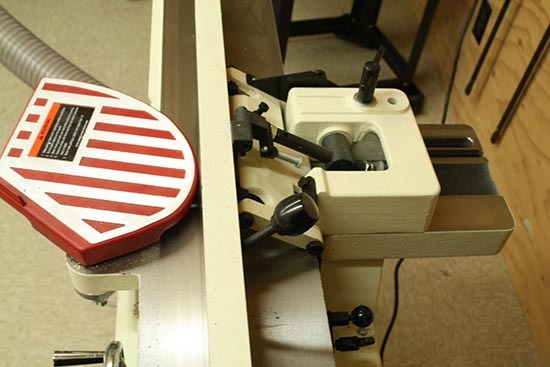 This jointer offers a two-way tilting fence with positive stops at 45 and 90 degrees. The fence has easy to use controls that are centrally located near the center of the jointer making it easy to quickly adjust the fence from the operating position. The fence is 4″ tall and just over 33″ long. I really like how well this fence operates and how easily it moves across the cast-iron tables. As pointed out above the fence was extremely flat and the pre-set angles were spot on from the factory. 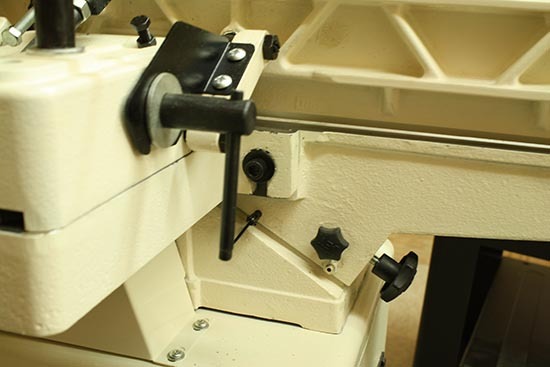 The JJ-6CSDX comes with three (2-sided) factory installed knives on the cutter head. The factory installed knives needed no adjustments right out of the box. One of the key features for this model is the auto-set quick change knife system. Once the knives are set-up and the cams locked in place, you can install a new set of knives by simply removing the old ones and installing new ones. No calibration is needed as the quick change system holds the correct knife spacing. Some people have commented that this limits the ability to have the knives sharpened forcing them to buy new knives. This to me seems like a small price to pay for being able to quickly change knives without the lengthy calibration process. The knives came extremely sharp and produced VERY smooth jointed surfaces. The cams that allow you to adjust the knives work very well. They provide plenty of adjustment and make adjusting the blades a real breeze. 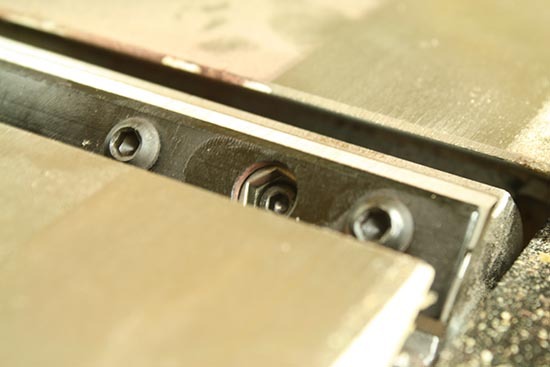 The cam holes are actually short slots which provides another avenue of adjustment. This allows you to slightly offset a knicked knife to the side so the other two blades can accommodate the remaining wood. This can be a real time saver if you have some knicked knives and you’re trying to finish a project on a tight schedule. 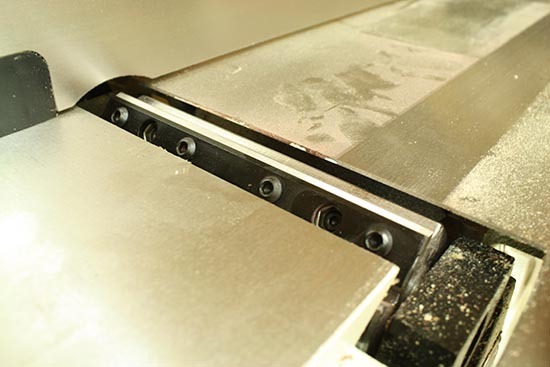 Jointers and planers are some of the toughest machines on dust collection systems because of the size and volume of chips that they produce. The JJ-5CSDX comes with a 4″ diameter dust port mounted on the left side of the lower cabinet / stand. 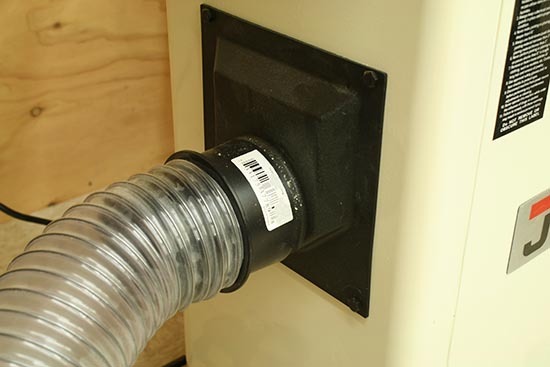 The dust port is made from plastic and accepts standard 4″ diam. dust collection hoses. My jointer is connected to a 3HP Delta dust collector which has no trouble keeping up with the dust/chips produced by this jointer. The sealed cabinet does a great job keeping all the dust confined to the cabinet so it can be effectively collected. The motor cabinet/ stand is built of heavy gauge steel with a very nice powder coat finish. The cabinet is fully welded together providing a very nice stiff and quiet base while the machine’s motor is running. The stand holds the table surfaces at just under 32 inches and around 34 inches on my mobile stand. These are very comfortable heights for working with material on the jointer. I only have one serious gripe with this machine and it’s the location and style of on/off switch. The on/off switch is located on the front of the motor cabinet about 12 inches below the table surface. Furthermore, the on and off switches are both push button switches. I would like to see JET use a more modern flip switch and consider mounting it at a higher level. The current switch is easy enough to turn on but I find it far more difficult to turn off especially when holding onto a large cumbersome work piece. Tools are only as good as they perform and the JET JJ-6CSDX does a great job at that! Over the course of 6 plus months I’ve used the jointer on all kinds of material including: Pine, Hard Maple, Walnut, Purple Heart and Poplar. I’ve used it for both face and edge jointing with great success. 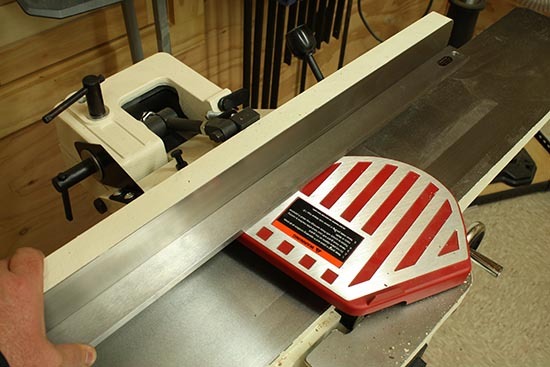 With sharp knives installed the jointer easily cuts through soft and hardwood with ease. The jointer consistently creates straight, smooth surfaces well within the tolerances I expect for fine woodworking projects. 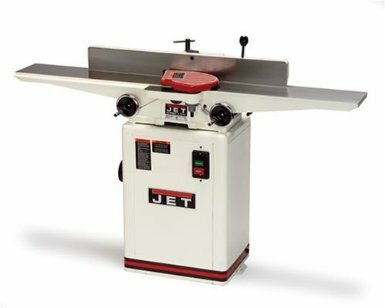 The JET JJ-6CSDX 6″ Jointer is well built, fully functional and perfectly sized for home woodshops. The extra long infeed and outfeed tables ensure extra precision when handling longer material. All that combined with the quick change knife system and I think this is a very good jointer priced right for home shops. 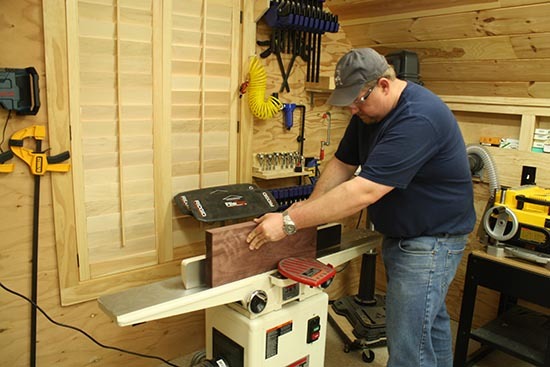 If you’re building up a home woodshop then this is definitely a jointer worth adding to the wish list. It offers great performance at a great price. 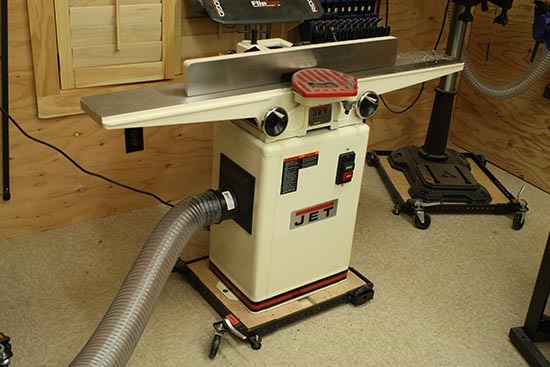 If you’d like to buy this jointer please check out the link below from Amazon. I buy a vast majority of my tools from them including large power tools and I’m always very happy with the price and service.